Norwich XI: Rudd, Bennett, Martin, Bassong, Brady, Howson, Tettey, O'Neil, Redmond, Hoolahan, Mbokani. Southampton XI: Stekelenburg, Martina, Fonte, van Dijk, Bertrand, Clasie, Steven Davis, Ward-Prowse, Wanyama, Tadic, Long. Why not pop over to the live coverage of all today's games to see where this leaves the Premier League table as we enter the second half of the campaign. It's all over, a good win for Norwich but a worrying slide for Southampton continues. Norwich go for the corner to waste time, and win a corner to eat up some more. Three minutes are being added on. The hosts are holding off a spirited rally from 10-man Southampton, but Rudd has had little to deal with. Declan Rudd is booked for time-wasting. Southampton are huffing and puffing to overcome their numerical disadvantage, but Norwich's goal has yet to be really threatened. Cameron Jerome replaces Mbokani, and Hoolahan comes off, with Martin Olsson coming on. Clasie and Tadic are off, and Harrison Read and the much-discussed Sadio Mane are on. Enough time to make an impact? Saints are shaken but come back at Norwich, but don't forget they are a man down. Long wins a corner, and Rudd punches confidently clear. Odjidja has made a real difference since coming on. He wriggled into room from the right then found Alex Tettey, who slotted home from just inside the area high into the top corner. A poor, late challenge on Odjidja by the Saints midfielder gives him his second yellow card and then the inevitable red. Southampton concede a free kick around 30 yards out, but as Brady shoots, referee Clattenburg blows his whistle. Tettey had shoved Wanyama out of the wall - no mean feat in itself, but it stops Norwich from getting a chance to break the deadlock. Martin stays forward after starting a Norwich attack and flashes a header from a Howson cross past the far post. Seconds later, Tadic has a chance from a tight angle at the other end but under pressure he hooks his shot a long way over the bar. Odjidja's first action is to win a corner, and Stekelenburg clears it, but only just, when he falls to his left under pressure from Hoolahan to punch it clear. Nathan Redmond is off, and Vadis Odjidja is on. Dusan Tadic wriggles into a dangerous area near the box from the left flank, but he chooses to pass rather than shoot - finding a defender and not a team-mate. Brady persists under pressure from Martina and tries an audacious backheel near the area, but it's style over substance with the ball going to a Southampton foot. Martin goes through late on Clasie, the Norwich skipper's foot going right down on top of the Dutchman's standing foot, but referee Clattenburg says 'no foul' - to boos from the Southampton fans. Brady puts in a teasing cross from the left that Stekelenburg has to jump to and stretch to claim with Mbokani lurking over his shoulder. As the rain sweeps across Carrow Road, the hosts are generally having the better of the second half, but they're not putting the Saints' goal under threat. An early free kick from Redmond, on the left, is collected very easily by Stekelenburg as Norwich miss a chance to put Saints under pressure. We're under way, with no substitutions made. That wasn't a half of the highest quality, but it did get better in the latter stages. Let's hope for an improvement after the break. Just one minute has been added on. Mbokani goes close again, sliding in to connect with a Howson cross from the right but seeing the ball fly just over and across the goal. Clasie drives in a swerving shot from just outside the area that may have just been squeezing in. Rudd takes no chances and makes a fine diving save low to his left. Good work from Brady inside his box, getting in the way of a Long pass that Davis was eyeing hungrily for a shot. A weak punch from the advancing Stekelenburg lands with Hoolahan just outside the area, he attempts a cheeky lob from range but only finds the top of the nets. Hoolahan tracks back all the way back down the pitch to block Long, conceding a corner. Van Dijk gets a powerful header in from six yards, but it's a long way off target. Victor Wanyama slides in on Nathan Redmond far too late and collects the game's first booking. Oooh! Norwich go very close, as Redmond's deflected pass from the right is stabbed just wide by Mbokani from two yards out. Within seconds Saints are thwarted Rudd, who gets down to block Long, who had gone clear and raced into the box. The game needed to liven up - and it has done. Norwich win a corner after Martina robs Hoolahan but cannot control the ball going back toward goal. Redmond swings it in, but the whistle goes for Hoolahan grabbing hold of goalkeeper Stekelenburg's shirt. That's all fairly standard for a lacklustre game so far. Southampton manager Ronald Koeman decided to leave out Sadio Mane this afternoon after the midfielder was late for a team meeting. Bertrand swings in a free-kick from near the right touchline. Rudd comes a long way off his line to punch clear over the top of several heads in front of him. Wes Hoolahan takes advantage of another Saints error in midfield and feeds Howson, but his ball across from the left towards Mbokani goes behind his striker and flies across the pitch harmlessly. On Sadio Mane being dropped to the bench after not turning up on time for a team meeting. "You want your best players to be playing. Imagine the boost for Norwich seeing him only on the bench. Neil Lennon [at Celtic] was once 45 minutes late and Martin O'Neill still played him." An even opening phase, with neither side dominating. It's been a cagey few minutes with neither side able to keep the ball long enough, or well enough, to worry the opposition. There's also been a few niggly fouls but nothing worth a card as yet. A fine run and pass n the left of the box from Ryan Bertrand sees the ball find its way to James Ward-Prowse, but his shot lacks venom and goes straight at Rudd. Jonny Howson spurns the best chance so far, latching on to a mistake from Jose Fonte on the edge of the box but hopping up into the air he rolls his attempt about a yard wide of the right-hand post. Saints get the first corner of the game when Brady blocks a Ward-Prowse cross. Bertrand's attempt clears the first man fails to find a red-and-white shirt; Norwich clear briefly, then Victor Wanyama skies a shot over the bar from long range. Norwich finally make an impression, with Brady nipping past Martina to the by-line to make a floating cross that Saints' defence clear. Brady quickly has another go, trying to find Mbokani but a Southampton boot gets in the way this time. It's an even start so far. Steven Davis gets the first shot of the day from the edge of the Norwich box, but Russell Martin makes the block. Seconds later the ball is back over the Norwich area, and Long makes a brave header under pressure from Rudd, but the ball floats over the bar. Jose Fonte's hopeful ball from deep over the top eludes Shane Long and is collected comfortably by Declan Rudd. Referee Mark Clattenburg's whistle gets the game under way, Norwich kick off with a despondent-looking Sadio Mane watching on from the Saints bench. And as the teams get ready, the VIP area is filling upand today it includes former Chancellor Ed Balls, who recently became Norwich's chairman. Impressive stuff from the Southampton mascot as he prepares to come on - he's just gone through a thorough and professional set of stretches and warm-up exercises. I'll just go and do the same while the teams emerge. "Norwich should go into 2016 quietly confident. Twenty points at the halfway stage means they're on target for Premier League survival. "In the likes of Wes Hoolahan, Robbie Brady and Nathan Redmond, they have star quality. They lack a prolific striker but it's a problem shared by their relegation rivals and I'm sure their impressive manager Alex Neil will look to address it in the transfer window. "All in all I think Norwich will stay up. "No such concerns for Southampton - well, there shouldn't be, but their form has declined significantly since October. "The 4-0 thumping of Arsenal on Boxing Day shines like a beacon alongside far too many recent defeats. "A good January will dispel any doubts otherwise Saints could spend the spring anxiously looking over their shoulders." Norwich were up against it from 31 minutes in when these two last met, on 30 August 2015. Steven Whittaker went for an early bath after receiving two yellow cards within three minutes, and the Saints claimed the win thanks to Graziano Pelle's opener and two from Dusan Tadic. And to underline the point, Dusan helpfully reminded his fans of his name while celebrating. See how your guesses fare against other supporters and pundit Mark Lawrenson, plus get feedback from BBC Sport's team including Gary Lineker and Alan Shearer. What are you waiting for? "Southampton can pull out some superb performances and some pretty poor ones. Their mentality is not as strong as it was last season and the players have been a bit inconsistent, particularly away from home where they have won just two from nine in the league." It's the naughty step for Sadio Mane this afternoon. The Senegal winger has been dropped to the Southampton bench after turning up late for a team meeting. Manager Ronald Koeman isn't pulling any punches. "He was in the team, but he was too late in the meeting," he said. "We have rules in the team." Oriol Romeu is also out due to suspension, with Jordy Clasie and James Ward-Prowse coming in. 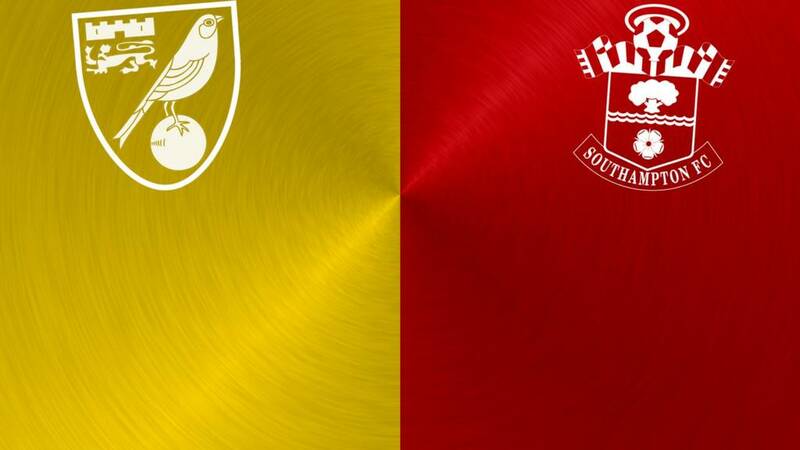 Southampton: Stekelenburg, Martina, Fonte, van Dijk, Bertrand, Clasie, Steven Davis, Ward-Prowse, Wanyama, Tadic, Long. Subs: Yoshida, Mane, Reed, Ramirez, Gazzaniga, Targett, Seager. Norwich, meanwhile, bring in Gary O'Neil for Graham Dorrans. Norwich: Rudd, Bennett, Martin, Bassong, Brady, Howson, Tettey, O'Neil, Redmond, Hoolahan, Mbokani. Subs: Whittaker, Jerome, Dorrans, Mulumbu, Olsson, Odjidja-Ofoe, Ruddy. Hello, and a happy new year to you, wherever you are. Without further ado, here's the team news from Carrow Road. Welcome to our live page for Norwich City v Southampton. We’ll have live text commentary here from 14:30 GMT. You can keep up to date with all the build-up to today’s games here.